Here’s another new brewery to grace this website — SKA Brewing Company, located in Durango, Colorado, began producing beer in 1995 when two underage guys (Bill Graham and David Thibodeau) decided the answer to them not being able to legally purchase beer was to make it themselves. Inspired by Ska music, (which, I must state, I am NOT a fan of — it’s kind of like American jazz combined with Caribbean music) they brewed some beer and found they were good at it. The beer up for review today is their Modus Hoperandi IPA, the canned version. This is brewed to feature citrus and pine flavors, comes in at 6.8% ABV (alcohol by volume), and 65 IBUs (International Bitterness Units). 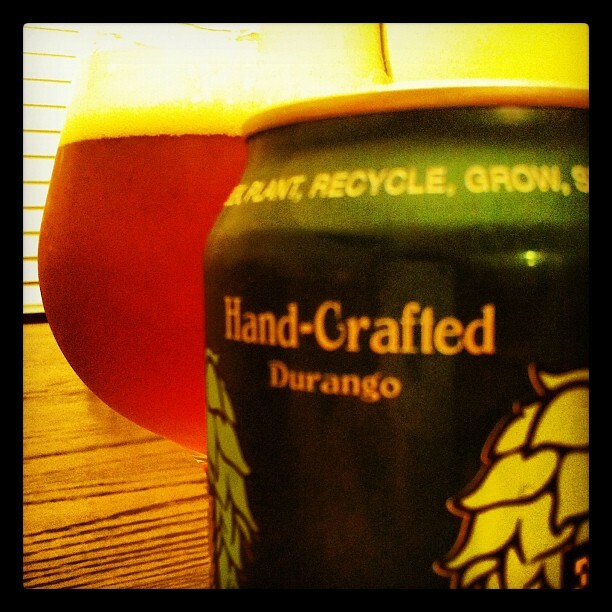 Modus Hoperandi poured an average size head, frothy and lasting. The color of the beer was very nice and classic IPA — it was orange, slightly bordering on amber, and had a clear body, free of particles and sediment. The lacing was solidly good, leaving behind a nice coating, thick and sticky in places. On the nose, there’s a big time hop presence, with huge notes of grapefruit, pine, and citrus of all variety — lemon, lime, and orange, especially orange. There’s underlying garlic, and a backbone of sweet caramel and bready malt. Great aroma, hop-forward but still maintaining a semblance of balance with just the right amount of malts. Tasting this beer, the palate is met with the promised citrus and pine, leading to a surprisingly malty middle that features our old friends caramel and a bread-like grain. The finish hits with a moderate amount of bitterness, like a deep resinous pine, and the bitter wave continues in a long wash. 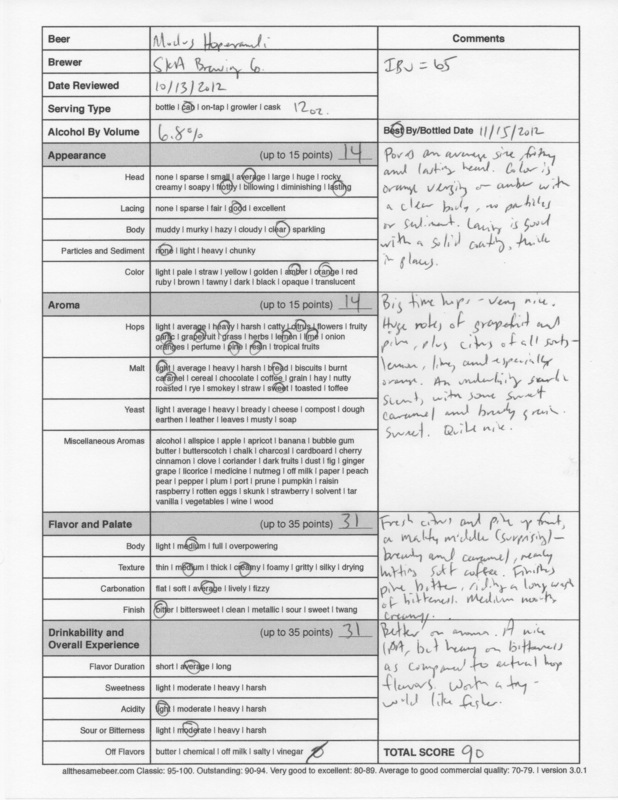 The mouthfeel was medium bodied, with a creamy texture and average carbonation. I thought this beer to be better on aroma in terms of complexity of the hops. The taste is indeed a nice IPA, but it’s heavy on the punch of bitterness and a little light on the actual flavor of the hops. That being said, I think I should probably sample a can that is a bit fresher just to see if those flavors are more vivid, and I wouldn’t pass this up if offered again. 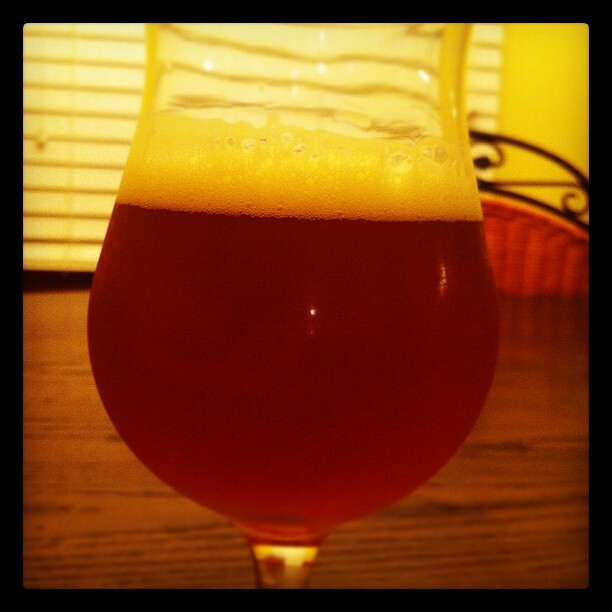 Modus Hoperandi is a solid beer any IPA lover would probably get a delight out of. 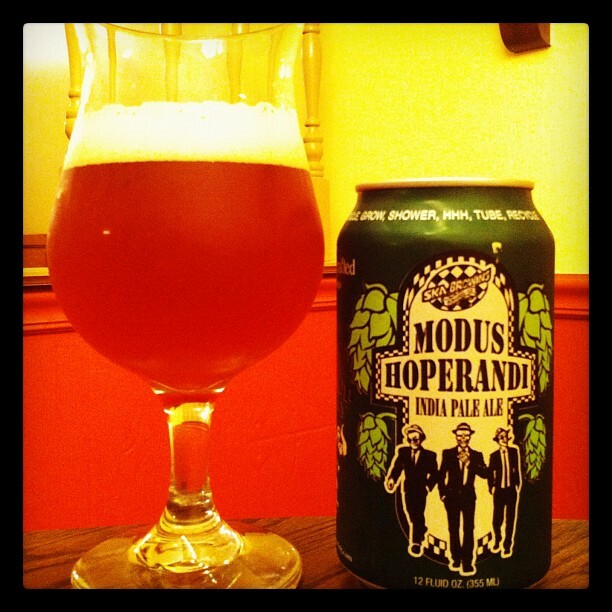 SKA Modus Hoperandi India Pale Ale, 90 points. Price: $1.99 US for one twelve ounce can.